Sofia Bruera graduated from the honors program at Southern Methodist University with a Bachelor of Arts in Psychology and a Bachelor of Arts in French in 2006. She attended University of Houston Law School where she was the business development editor of the Houston Journal of Health Law & Policy. During law school, she received a publication award for an article written for the journal. 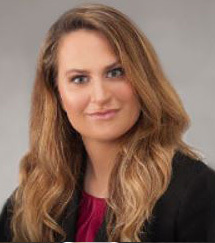 Sofia was licensed to practice law in Texas in 2009. She is fluent in Spanish and French. American Medical Systems Pelvic Mesh MDL No. 2325. In addition to MDL experience, Sofia has worked on a variety of state court pharmaceutical and medical device cases. These cases include the Paxil birth defect litigation and PPH cases against the diet drug manufacturer Herbalife, in which she drafted motions, presented Plaintiffs and took depositions. Additionally, Sofia worked on several Fentanyl patch cases in which she handled depositions and motions including a pivotal response to a Motion for Writ of Prohibition before the West Virginia Supreme Court. The Court issued a seminal ruling in that case permitting Fentanyl patch cases to proceed in West Virginia where the Defendant was located. Most recently, Sofia has worked on a litigation involving the drug Tysabri. Tysabri causes a fatal brain virus known as progressive multifocal leukoencephalopathy (“PML”). Sofia has handled every aspect of these cases. The cases have been filed in courts across the country including California, New Jersey, New York, Utah and Massachusetts. Given the number of cases, she moved for the first consolidation of these cases in the country in Massachusetts State Court. She recently received a favorable result on a forum non conveniens issue before the Massachusetts Appeals Court on one of her cases. “Emerging Litigation: Controversy over Power Morcellators” in Trial Talk Magazine December/January 2015 and “Remand in Maritime Cases” Admiralty Law Newsletter, Winter 2015. Texas Monthly Magazine named Sofia a Rising Star from 2014-2017. Sofia has also been named one of the top 100 National Trial Lawyers and top 100 Mass Tort lawyers for 2017.